Build better connections. Grow your business. Your end users — architects, engineers, fabricators, and contractors — don’t want to be sold to; they want to self-educate and learn as much about your products as possible before committing them to their projects. They demand complete control over the information they need — in terms of how they get it and how they use it. 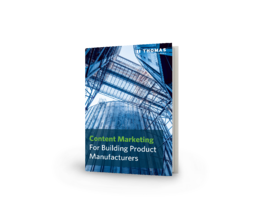 Our eBook, Content Marketing For Building Product Manufacturers, can put some of the control back in your hands, while still respecting your end users and your distribution partners. Want to learn more about how content marketing works and how you can leverage it to grow your business? Fill out the form to get your copy of this valuable eBook now. YES, I want to download this eBook.